Pendulum Effect: Once per turn, if a face-up "Odd-Eyes" Pendulum Monster(s) you control is destroyed by battle or card effect: You can destroy 1 card in your Pendulum Zone, and if you do, place 1 fac..
Once per turn, during your Main Phase, if this card was Normal or Special Summoned this turn: You can Special Summon 1 Level 3 or lower "Performapal" monster from your hand in Attack Position. During ..
Once per turn, during your Main Phase, if this card was Normal or Special Summoned this turn: You can target 1 other "Performapal" monster you control with 1000 or less ATK; change both it and this ca..
Once per turn: You can inflict 600 damage to your opponent, also monsters in your possession cannot activate their effects for the rest of this turn, except "Raidraptor" monsters. When this card is de..
2 Level 4 Winged Beast-Type monsters.If this card is Xyz Summoned, and your opponent's LP is at least 3000 higher than yours: You can make this card gain 3000 ATK. When this card destroys an opponent'.. When this card is Tribute Summoned: You can change all monsters on the field to face-up Attack Position. You can Tribute 3 monsters to Tribute Summon (but not Set) this card. If Summoned this way, whi.. While this card is in your hand or Graveyard: You can banish 3 other monsters from your Graveyard; Special Summon this card, also you cannot Special Summon other monsters for the rest of this turn. Du..
Once per turn: You can discard 2 cards, then target 1 face-up monster your opponent controls; equip that face-up monster to this card. This card gains ATK equal to the combined original ATK of the mon.. When this card is Tribute Summoned while you control no Spell/Trap Cards: You can activate this effect; your opponent declares either Continuous Spell or Continuous Trap, then you Set 1 card of that t..
Once per turn: You can declare 1 card name; look at your opponent's hand, then if they have the declared card in their hand, apply 1 of these effects. :- Take control of 1 monster your opponent contro..
You can Ritual Summon this card with "Machine Angel Ritual". If this card destroys a monster by battle and sends it to the Graveyard: Inflict damage to your opponent equal to that monster's original D..
You can Ritual Summon this card with "Machine Angel Ritual". If this card is Ritual Summoned: You can add 1 Ritual Spell Card from your Deck or Graveyard to your hand. If this card is Tributed: You ca..
You can Ritual Summon this card with "Machine Angel Ritual". If this card is Ritual Summoned: You can make your opponent send 1 monster they control to the Graveyard (their choice). If a Ritual Monste.. This card can be used to Ritual Summon any "Cyber Angel" Ritual Monster. You must also Tribute monsters from your hand or field whose total Levels equal or exceed the Level of the Ritual Monster you R..
You can discard 1 Spell Card; add 1 LIGHT Ritual Monster or 1 Ritual Spell Card from your Deck to your hand. You can shuffle any number of Spell Cards from your Graveyard into the Deck, then target 1 .. If a Level 8 or higher Dragon-Type Synchro Monster is on the field, you can Special Summon this card (from your hand). You can only Special Summon "Red Nova" once per turn this way. If this card is se.. Cannot be Normal Summoned/Set. Must be Special Summoned (from your hand) by Tributing a monster you control with 10 Zushin Counters, and cannot be Special Summoned by other ways. Once per turn: You ca.. While you control 2 or more face-up Defense Position monsters, your opponent cannot target Defense Position monsters you control with card effects, also those monsters cannot be destroyed by your oppo..
2 "Number" Xyz Monsters with the same name and Rank. Once per turn: You can detach 1 Xyz Material from this card; this card gains ATK equal to the combined Ranks of all Xyz Monsters currently on the f..
2 Level 6 monsters. Once per turn, during either player's turn: You can detach 1 Xyz Material from this card, then target 1 face-up monster on the field that was Special Summoned from the Extra Deck; ..
2 or more Level 2 monsters. Once per turn: You can detach 1 Xyz Material from this card, then target 1 other face-up card on the field; while this monster is face-up on the field, that target has its ..
3 Level 3 monsters. Cannot be destroyed by battle. At the end of the Damage Step, if this card battled: You can detach 1 Xyz Material from this card; place 1 Counter on this card (max. 3). At the end ..
2 Level 4 monsters. While you control no other cards on the field, this card is unaffected by other cards' effects. Once per turn, during either player's turn: You can detach 1 Xyz Material from this ..
2 Level 1 monsters. Once per turn, during either player's turn: You can detach 1 Xyz Material from this card; your opponent randomly chooses 1 card in your Extra Deck, and if it is a "Number" monster ..
2 Level 4 monsters. When any player's monster declares an attack: You can detach 1 Xyz Material from this card; change that monster to Defense Position. During either player's turn, while this card i.. If you control a "Cipher" monster or "Kinetic Soldier" in your Monster Zone, you can Special Summon this card (from your hand). 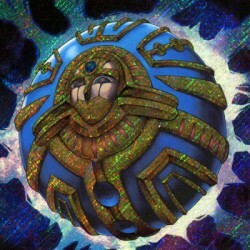 You can Tribute this card; increase the Levels of all "Cipher" monsters ..